They sat side by side, with their backs to the wind, and drank soup out of tin cans. The taste made her giddy. It made her want to laugh. Matteo ate whole sausages in a single mouthful. Sophie took four and made them into sandwiches with the venison. She added a slop of soup as a relish, and they ate them with both hands. Sophie’s hair blew in her mouth, and she tied it back with one of Matteo’s bow-strings. She couldn’t remember having been so happy before. I spent the Easter weekend lost in a stack of books. After months of living out of a suitcase, unable to justify the weight of paperbacks in my bag, I've moved into a house and unpacked. My clothes are on hangers, my spices and sauces fill the kitchen cupboards, and I was reunited with books I've long planned to read, but not been able to lay my hands on. And so, for a good few days over the Bank Holiday weekend, I retreated to an armchair, with a pot of tea, and read my way through a small pile of books. Rooftoppers has been on my list for a long time. I've heard only brilliant things, and since finishing Lucy Mangan's gorgeous Bookworm, a memoir of childhood reading, I've been on the hunt for some truly great children's books. This, Katherine Rundell's second novel, is a joy; I already have a list of friends' children I want to pass it on to once they’re old enough to appreciate it. As a particularly unadventurous child, I lived vicariously through the adventures of my favourite fictional characters. I wish Rooftoppers had been around when I was a child; Sophie is exactly the type of heroine I happily admired from the safety and security of the bottom bunk. This rooftop picnic, shared between Sophie, a (not quite) orphan who has grown up in London, and Matteo, who has made a home on the rooftops of Paris, is one of the most evocative and mouth-watering descriptions of a meal I have come across in a long time. The food is carefully wrapped up in greaseproof paper by Sophie’s guardian, and taken by her to Matteo’s rooftop. He is waiting there, having found a crate of tomatoes, which they turn into a soup. Then he and Sophie unwrap pleasure after pleasure: warm rolls filled with butter, a whole sticky chocolate cake and a pot of cream, and a parcel of sausages, which they stick onto antennae and cook over a fire. 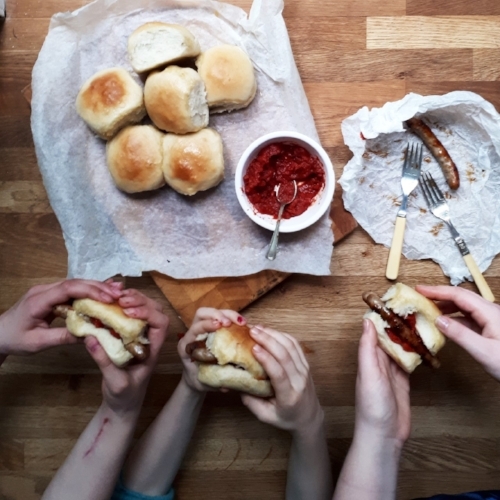 The sticky chocolate cake and pot of cream will wait; I wanted to make soft, pillowy rolls, tomato relish, and a pile of sausages. I invited a couple of the younger neighbours round, and we ate the feast with our hands at the kitchen table. I’ve already promised to drop a copy of the book round. 1. Place the flours (start with only 220g of plain flour) and salt in a large mixing bowl, or the bowl of a mixer. Put the yeast, sugar, water, and oil in a jug, and stir to combine. Pour the liquid into the bowl and mix by hand. The dough is quite wet, so mix it in the bowl for a bit before tipping it onto your work surface, and then knead for around 10 minutes. Eventually, the dough will become soft, and elastic. If it remains unmanageably sticky, add some of the extra 60g of flour. It’s ready when a small piece pulled away from the dough will roll into a ball without sticking to your fingers. A note here: If I had access to a mixer with a dough hook at the moment, I absolutely would have turned it on for this. Kneading it by hand is fine, and you will get there, but it’s a damp dough, and it stuck to everything in my kitchen. 2. Wash up your mixing bowl, and grease with a little vegetable oil. Put the dough in the bowl, cover, and leave in a warm place for about an hour, until it doubles in size. 3. Once your dough bounces back when prodded, tip it out onto your work surface. Weigh the dough, and divide the weight by 12. You should be able to shape 12 balls that are between 75 and 80g each. Pull off clumps of dough and weigh them, before shaping them into balls by pulling the dough tight and gathering it at the bottom. Roll against the work surface under your hand until they are tight and spherical. You can divide up the dough by eye, of course, but the buns will cook more evenly if they’re all the same size. 4. Line a roasting tray or baking dish with greaseproof paper, and place the buns into it, about a centimeter apart. Cover with a tea towel and allow them to double in size again; they should need about 45 minutes. Preheat your oven to 200C. 5. While they rise, make the tomato relish. Bring the tomato to a simmer in a small saucepan. Season with the sugar, salt, vinegar, and pepper, and allow it to reduce over a low heat until thick and spreadable. 6. Transfer the risen buns to the oven, and bake for 15-18 minutes, until golden brown on top. Cook the sausages in a frying pan, and keep warm until the bread is baked. Take the rolls out of the oven, and spread the tops with melted butter. Serve with the relish, and sausages, while the bread is still warm.